I’m not a child psychologist, but I am a “NeeNee”. That might even give me more authority to voice an opinion on what helps kids eat better. I say… let them make their own placemats and they shall eat (better!). Some printed cutouts, glue, clear contact paper. Everything needed to make placemats. Oh, and let’s not forget sticky cut out shapes. 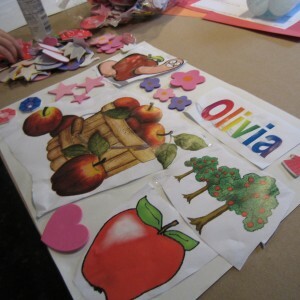 I made these placemats with the grand kids for AppleFest week. The theme, of course, was apples. We picked apples, went to the local orchard, and attended the community AppleFest. The kids got a kick out of making their own placemats which we later used for dinner. The whole project for 3 kids…. less than $1 per child. This is an ideal seasonal craft. We will be doing Christmas and Thanksgiving placemats as well. Hmmmm… now that I think of it, this could be a fun pre-dinner craft for adults too. Where can you purchase contact paper? Clear contact paper can be purchased at any large discount store, like Target or Walmart.